The damaged towing truck is towed away from the scene in Berlin, Germany, Dec. 20, 2016, the day after the truck ran into a crowded Christmas market, killing at least 12 people and injuring nearly 50 more. The Chief Federal Prosecutor's Office says it released the man, a Pakistani national, because it did not have enough evidence to charge him with a crime. "The investigation up to now did not yield any urgent suspicion against the accused," the prosecutor's statement read. The head of Germany's Federal Criminal Police force said the true terrorist behind the attack could still be at large and said police have not yet found the gun believed to have been used to kill the truck's driver before it was stolen. Chancellor Angela Merkel said it would be "especially hard for us all to bear" if someone who sought protection and asylum was responsible. "This would be especially despicable for the many, many Germans who day in, day out are active working for refugees as well as for those people who actually need our protection and who make an effort to integrate into our country," she said Tuesday. 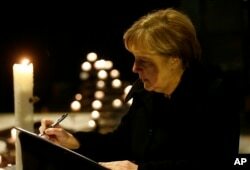 German Chancellor Angela Merkel signs the condolence book at the Memorial Church in Berlin, Germany, Tuesday Dec. 20, 2016, one day after a truck ran into a crowded Christmas market in Berlin and killed several people. The U.S. State Department had earlier called for caution in market places and other public sites across Europe. A published U.S. travel alert said extremist groups were focusing their attention "on the upcoming holiday season and associated events." It also warned U.S. citizens on the continent to be on the alert for "self-radicalized" extremists, who it said could strike without warning. "His face was swollen and bloodied. It was really clear that he was fighting for his life," Ariel Zurawski told German broadcaster TVN. Monday's crash bore strong similarities to a truck attack earlier this year in southern France that killed scores of people and wounded many others as France celebrated a national holiday.